An accountant is one of the main players in any business, be it at a large corporation or a small to medium enterprise. While in the past this role has seen them primarily involved in the monitoring and recording of transactions through an organisation, this role is now evolving. This was the key takeaway from the opening day of the 39th National Conference of Chartered Accountants, at the BMICH in Colombo last evening. Today (9) and tomorrow (10) will see technical sessions featuring a fascinating line-up of local and international speakers, including international record-setting triathlete James Lawrence, business tycoon Dhammika Perera, as well as the founders of Kapruka and PickMe, among many others, who will steer the sessions along this year’s theme ‘Hyperleap’. ‘Hyperleap’ in a nutshell is reference to the ever-changing technological landscape the world is traversing at present, where no industry is safe from disruption, thus resulting in the rapidly changing global economy we see today. “As technology has impelled finance professionals to grow at a rapid speed in order to stay relevant, keep up and thrive in this ever-evolving landscape, there is an increasing need for Chartered Accountants to evolve and change with time,” said National Conference Committee Chairman Dulitha Perera, setting the tone for the event in his opening remarks. 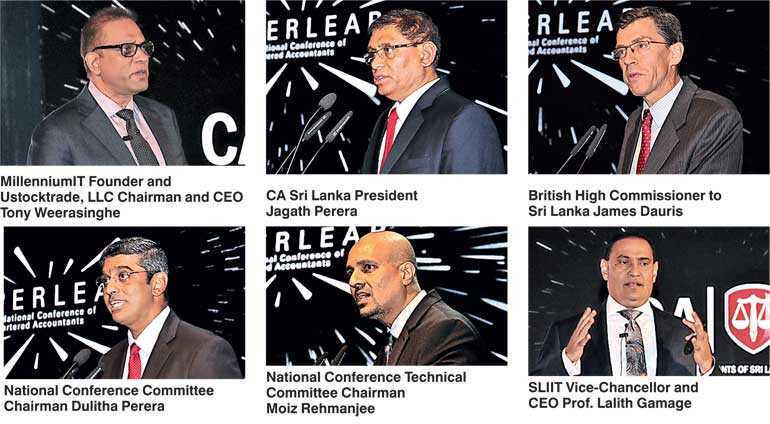 Perera’s comments were echoed by President of the Institute of Chartered Accountants of Sri Lanka (CA Sri Lanka) Jagath Perera, who noted the considerable impact on the role of accountant with the influence of disruptive technologies. “This has renewed the call for us as professional accountants to comprehend the need to adapt with time, while understanding that technology is here to stay and we have to work beside it, and not against it,” he said. How real is the threat of redundancy? It was in this context which Keynote Speaker Tony Weeresinghe took the stage. Weeresinghe stakes claim to building some of the world’s most sophisticated trading systems, including the current platform for the London Stock Exchange. He is also the Founder of MillenniumIT, the Chairman/CEO of Ustocktrade, LLC as well as Co-Founder/Director at The Cainan Foundation. At the top of his speech he addressed the elephant in the room, so to speak – will accountants be replaced by computers? According to Weeresinghe, as per a recent report, 50% of jobs in the world – or two billion, to put a number on it – would disappear by 2030. This though, he said, did not necessarily mean the loss a job per se, rather a job title. “Fifty per cent of jobs is the title that you have, not the people. And according to McKinsey – you sometimes think what you can’t automate, you’re sure of your job – but according to McKinsey what you can’t automate, won’t be a job for much longer,” he explained. However as Dulitha Perera explains, the “renewed complexities and challenges” cropping up in accountancy as a profession means that there will always be a need for human beings in the job – though maybe not in the traditional sense. “It would be impossible to program a computer or create a software program with the ability to exercise the judgement a fully-trained, senior accounting professional has at their disposal,” says Perera. “Think of all the recent changes in the laws and regulations, application of different rules to different industries, reporting standards that go through constant changes, while financial accounting and reporting has become more of an interpretative science. In terms of the future there are three main converging factors, which Weeresinghe believes will shape the world in the years to come: Robots, Artificial Intelligence, and Crypto Currency. The world is changing faster than we realise, he explains. The automation side of things will also impact the financial industry differently, where the financial roles required in an organisation may not be what they once were, though certain skills may be transferable. “In order to remain relevant, as chartered accountants we need to upscale ourselves. Change is what is happening around us,” warns the CA Sri Lanka President. Weeresinghe agrees, citing job titles such Chief Data Scientist, Chief Compliance Officer, Chief Digital Risk Officer, and Chief Cash Investment Officer, as some new roles which may arise in the very near future – ones which cannot be performed solely by computers. “You are more important than ever. You’re best suited to understanding the business. So using these tools of AI, do something different and more important to the organisation,” he says. This ties in nicely with a point Dulith Perera was making in that, even at present, accountants are “an elemental force to the organisation’s governance and strategy execution”. “This requires a very particular type of person that has been trained to think and analyse in a very unique way. What is important from the training we acquire is not the ability to create an audit plan or tick and tie up or executing of an accounting task in an organisation, it is the dynamic aspect of accounting which is knowing the art of interpreting those facts. The context surrounding all of these topics of conversation is the fact that some 40% of CA Sri Lanka members are under the age of 45. These means that there is an entire generation of accountants who have grown up studying and learning to do things a certain way. According to the CA Sri Lanka President Jagath Perera, this is something that needs to be addressed at a curriculum level. “We need to make sure they are positioned correctly and their future will not be challenged. So we need to work hard to make sure all what is discussed about these external factors are being taken care of, and we are ready. The only way is for us to think differently,” he points out. All this said however – with punchlines such as artificial intelligence, block-chains, machine learning technologies, millennial wave, social media revolution, and changes to the global economic order – the single unanswered question remains as to what this means for everyone.